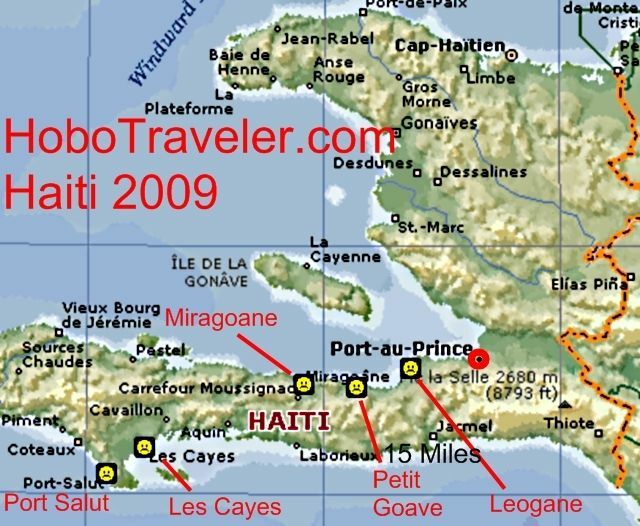 I leave Miragoene today, and travel to Petit Goave, Haiti. I now believe the interesting aspect of Haiti is its Seaports. The country has more coastal communities than any country I have ever visited. Plenty of beaches, but a beach needs people to be fun. I have not observed beach-going cultures here in Haiti. NGO’s are like nerds with a mission, United Nations military are compose of men from Sra Lanka, and Uruguay, I am sure there are more countries, but I assure you, these cultures are not going to the beach for fun, yes to drink, but not to lie around in the sun. I am positive I could find a naked black Haitian girl at the beach. To find one girl in a bikini would be more difficult. I found a few naked ones bathing in the river; I was not brave enough to take the photos. A person needs to enjoy the culture of seaports here in Haiti, which is great for me, terrible for tourism. Haiti is a friendly country; the people are happy, say hello and want to mingle. However, there is no language of conversation, Creole is awkward, and the education level is low, if not the lowest. What to do in Haiti? This place is perfect for an American that wanted to make a cheap trip to Africa without going to Africa. This is not Africa, the whole tribal culture is missing, this is an ex-slave community, pretty much like all the other Caribbean Islands. Trinidad and Tobago are about the same as Haiti, just more violent. Hmm, I have to admit, I just realized Haiti feels safer than Trinidad and Tobago, and I for sure think it is safer than Belize City. I have been to Africa five times, I do not need to come to Haiti to see a watered down version, but truly a great cultural experience for an American. My big problem is still Port-au-Prince, I need to find a 500 Gourde per night Hotel, the guidebook starts out at 1400, so way over budget for a Backpacker. I am studying the map; I believe it is possible; I am still in ready-to-retreat travel mode. If there is a problem, I will retreat to the prior Hotel. I am only going 15 miles today, this is interesting, this is a small country. I can be anywhere in the country in one good day of travel, all cities are possible, travel is not difficult, the price of Hotels is the problem.